What! Can we now find tattoos on nice people? Tattoos used to be associated with rebellious behavior: Sailors on leave, ex-cons, biker gangs looking for trouble. But now it seems every third sorority girl has a unicorn on her ankle. So that rebellion thing, that’s pretty much in the past, right? Enter Viren Swami of Anglia Ruskin University in the UK. He wanted to know if the old stereotype still has currency. He surveyed almost four-hundred Londoners about body art and aggressive tendencies. These included hostility and verbal and physical aggression. About twenty-five percent of the participants had at least one tattoo. These folks also reported more anger, verbal aggression, and rebelliousness than the non-tattooed people. Still, the overall increases for the tattooed set were pretty minimal. And the researchers found NO increase in physical aggression. Future studies may take tattoo type into account. 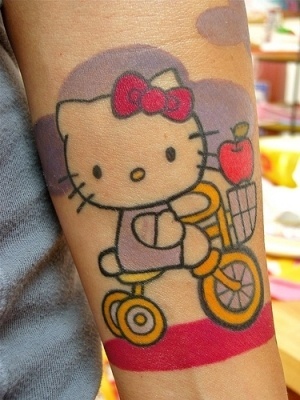 Because nothing says “rebel” like an angry Hello Kitty! tat! Rowr!